You may be familiar with the Radisson Blu hotel chain, but you may not know that the brand has a luxury subsidiary called the Edwardian Collection. As the name suggests, Radisson Blu Edwardian is a cut above the average hotel offering. It is a collection of 11 four and five star hotels in central London and Manchester. This bespoke collection is the official partner of The National Theatre and many of London’s theatre productions - which makes it the ideal choice if you’re a keen theatre goer and want to be close to the action when you come to watch a show. Radisson Blu Edwardian is not just renowned for its luxury accommodation, it’s also highly regarded for its restaurant and spa offerings. You can dine in Scoff & Banter, Steak & Lobster, Annayu and Leicester Square for pre-show meals with an International flavour. If you need a bit of pampering, four of the Radisson Blu Edwardian hotels offer luxury spa facilities that’ll have you in a state of bliss - you’ll never want to leave! 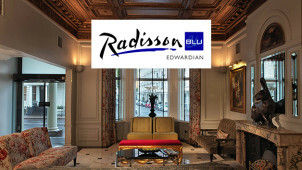 How do I use my Radisson Blu Edwardian voucher code? Check out the ‘Special Offers’ to get last minute deals and reduced accommodation rates. What are the Radisson Blu Edwardian check-in and check-out times? You can check-in from 3pm onwards. Check-out is at 11am. There is also an online check-in option. Is there a concierge service at Radisson Blu Edwardian hotels? Yes, the concierge team will tend to requests such as: baggage storage, theatre and sightseeing bookings, flower arrangements, car hire, and valet parking is available on request. Can I get a Radisson Blu Edwardian brochure? Yes, you’ll find downloadable PDF versions of the hotels, corporate and event brochures on this page of the website. Is Radisson Blu Edwardian a responsible hotel chain? Yes, Radisson Blu Edwardian takes corporate responsibility and sustainability seriously. You can read up on its pledges and sustainability commitments here. All booking reservations are confirmed with an email, which has your booking reference included. To amend or cancel your booking, please give as much notice as possible. You should speak with customer services or contact the team at the hotel you’ve booked with. Radisson Blu Edwardian hotels are open 24 hours a day. Radisson Blu Edwardian is a collection of luxury boutique hotels located in central London and Manchester. If you’re lucky enough to have a Radisson Blu Edwardian voucher code, why not book a few nights in London over a long weekend? You'll make such great savings on your booking that you’ll be able to go on a shopping spree and treat your significant other to a few slap-up meals too! If pampering and wellbeing are high on your agenda when you book a hotel, you’ll be delighted to hear that four of the Radisson Blu Edwardian hotels offer high class spa facilities. The Mayfair Spa boasts a decadent and calming environment in which to relax and unwind after a stressful week. Facilities include an aromatic steam room, herbal sauna, experience showers, ice fountain and candlelit relaxation room with heated beds. The perfect start to any weekend away! If you’re planning a trip to the West End for the theatre, we’d recommend booking into the Radisson Blu Edwardian Bloomsbury Street, just a stone’s throw from London’s theatrical quarter. Use a Radisson Blu Edwardian discount code to save some money on your accommodation so you can stay somewhere more luxurious without the sky high price tag. Perks include complimentary WiFi, breakfast and newspapers.